These Spicy Roasted Chickpeas are my absolute favorite way of cooking chickpeas. They can be a snack, a side, salad topping, buddha bowl filler, daal topping, curry topping, a topping to almost any dish. They have so much flavor and spice that it can make any "boring" salad, more fun and tasty! I like to throw them on everything honestly. I make these at least twice a week! This will for sure become a staple in your kitchen and always a part of of your Sunday meal prep (or which ever day you do it). 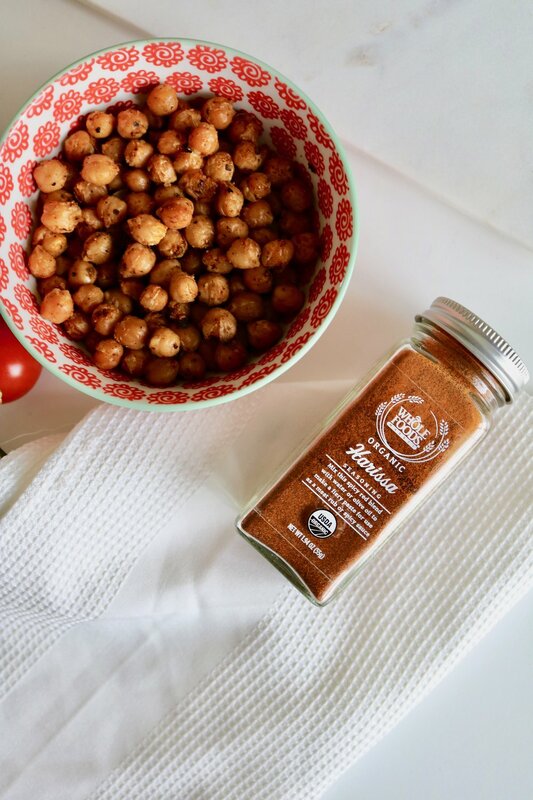 These are great for anyone but if you are a vegan or vegetarian or maybe you're just having a meat-free meal then these roasted chickpeas are great to add for protein. As well they are high in fiber. Chickpeas are also great for digestive health, inflammation and IBS. So... eat more chickpeas! 2. Rinse your chickpeas (if they are coming from a can). 3. Pour the chickpeas on the pan. 4. Add Harissa, turmeric and a little salt and pepper to the chickpeas and mix. 5. Let them roast/cook for about 15 minutes, while stirring occasionally. If they start popping (you'll know if it happens) then turn the heat down and stir more often until the "popping" stops.